Vaccination is the most effective way to prevent influenza illness and associated complications. For the CDC SUMMARY of Prevention and Control of Influenza with Vaccines 2017–18 Influenza Season. Annual influenza vaccination is associated with a reduction in influenza-related respiratory illness and physician visits. Hospitalizations and deaths among high risk persons are reduced by annual vaccination. Influenza vaccination has also proven effective in reducing otitis media in children and absenteeism in working adults. Every year the CDC and the World Heath Organization select influenza A and influenza B strains that have the highest probability of causing a pandemic in the upcoming flu season. These virus strains are then used by vaccine manufacturers to produce the annual vaccine. When the seasonal vaccine is well matched with the actual reassorted strains in circulation, a high inoculation rate can induce herd immunity and limit the spread of epidemics. Inactivated influenza vaccines (IIVs) are available in both trivalent (IIV3) and quadrivalent (IIV4) formulations. Cell culture inactivated influenza vaccine (ccIIV) are available in a quadrivalent formulation (ccIIV4). FluMist Quadrivalent (LAIV4; MedImmune, Gaithersburg, Maryland) should not be used during the 2017–18 season due to concerns about its effectiveness against influenza A(H1N1)pdm09 viruses in the United States during the 2013–14 and 2015–16 influenza seasons. For the 2018–19 U.S. influenza season, providers may choose to administer any licensed, age-appropriate influenza vaccine (IIV, recombinant influenza vaccine [RIV], or LAIV4). LAIV4 is an option for those for whom it is otherwise appropriate. No preference is expressed for any influenza vaccine product. The Advisory Committee on Immunization Practices will continue to review data concerning the effectiveness of LAIV4 as they become available. Providers should be aware that the effectiveness of the updated LAIV4 containing A/Slovenia/2903/2015 against currently circulating influenza A(H1N1)pdm09-like viruses is not yet known. Trivalent Influenza Vaccine is A/Michigan/45/2015 (H1N1)pdm09–like virus, an A/Hong Kong/4801/2014 (H3N2)-like virus, and a B/Brisbane/60/2008–like virus (Victoria lineage). All IIVs contain hemagglutinin (HA) from inactivated virus (killed virus) incapable of replication. The HA is derived from influenza viruses antigenically identical to those recommended for a specific season by the FDA. 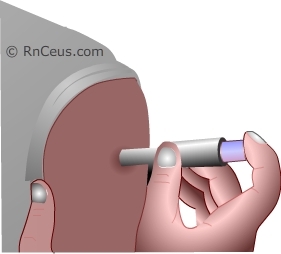 IIVs are delivered via intramuscular (IM) needle injection or prefilled intradermal micro-injection afterwhich the immune system responds by making antibodies to the viral HA. An intradermal quadrilent IIV is available. It is given into the dermal layer of the skin via a single-dose, prefilled microinjection syringe and that contains less antigen than the intramuscular IIV formulations. The intradermal vaccine was approved for use in people 18 through 64 years of age in 2017-2018. Live-Attenuated Influenza Vaccine (LAIV) is not recommended for the 2017–18 season, but it is being recommended for the 2018-19 influenza season. On February 21, 2018, Advisory Committee on Immunization Practices (ACIP) recommended that LAIV4 be an option for influenza vaccination of persons for whom it is appropriate for the 2018–19 season. Quadrivalent LAIVs contain two strains of Influenza A and two strains of Influenza B attenuated virus (weakened virus). LAIVs have been genetically manipulated to replicate efficiently at 25 degrees Celcius and not at all above 39 degrees Celsius. The genetic alteration limits the viral infection to cells in the cooler nasopharynx. LAIVs are manufactured to be delivered by intranasal mist. The immune system responds to the limited nasopharyngeal infection by producing antibodies. Several different IIV preparations are available to meet specific needs within the population. Flu shots are approved for use in people as young as 6 months of age and older. Children 6 months through 8 years of age may need two doses during the same flu season to reach immunity. Reduced immune function in the elderly may require a vaccine with higher dose of antigen or an adjuvant to acheive adequate immune response. High dose vaccine may be 24% more effective in persons over 65 years. Persons working in a healthcare settings should be vaccinated annually against influenza. A history of Guillain-Barré Syndrome (GBS) within 6 weeks following receipt of influenza vaccine is a precaution for the use of influenza vaccine. Note: There are certain flu shots that have different age indications. For example, people younger than 65 years of age should not get the high-dose flu shot or the flu shot with adjuvant, and people who are younger than 18 years old or older than 64 years old should not get the intradermal flu shot. History of allergy to eggs or any of the ingredients in the vaccine. History of Guillain-Barré Syndrome (a severe paralyzing illness, also called GBS). Getting vaccinated is the most effective way to prevent influenza illness and its associated complications. It is the best way to protect your patients, your family and ultimately yourself. Inactivated influenza vaccine (killed virus) may be used to vaccinate all health care personnel who have no contraindications due to personal health conditions. healthcare personnel vaccinated with killed virus present no risk to the very young and severely immunosuppressed persons. children aged 6 months through 8 years require 2 doses of influenza vaccine (administered a minimum of 4 weeks apart) during their first season of vaccination for optimal protection. Children aged 6 months through 8 years who have previously received ≥2 total doses of trivalent or quadrivalent influenza vaccine before July 1, 2017 require only 1 dose for 2017–18. The 2 doses of influenza vaccine do not have to have been administered in the same season or consecutive seasons. Children in this age group who have not previously received ≥2 doses of trivalent or quadrivalent influenza vaccine before July 1, 2017 require 2 doses for the 2017–18 season.